The famed boxing franchise Ready 2 Rumble returns in 2009 when Atari launches Ready 2 Rumble: Revolution. 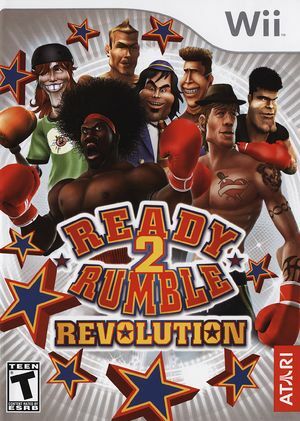 Whilst maintaining all the humorous caricatures and fun boxing action that made the original Ready 2 Rumble Boxing Round1 and Round2 (Midway) such knock-out best-sellers, the new digitally sophisticated and visually stunning motion-controlled Ready 2 Rumble: Revolution for Wii brings a new level of style and attitude to the boxing ring and continues the franchise with a host of hard-hitting enhancements. The graph below charts the compatibility with Ready 2 Rumble: Revolution since Dolphin's 2.0 release, listing revisions only where a compatibility change occurred. This page was last edited on 13 January 2018, at 08:32.